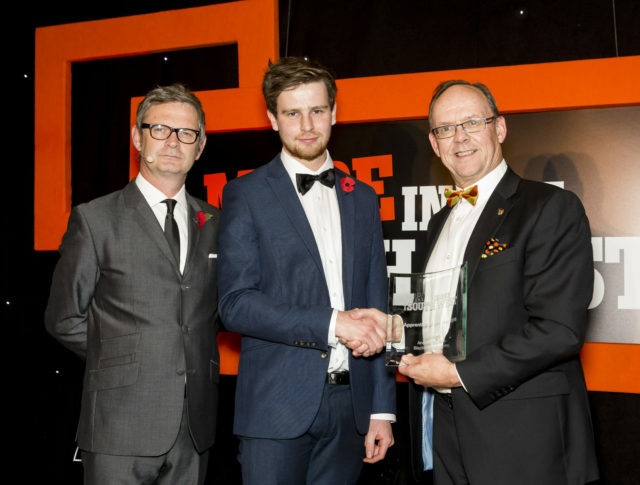 Andrew Burrows, an apprentice with Blackhill Engineering, has won Apprentice of the Year at the Made in the South West Awards. The prestigious event hosted by South West Insider Media showcases and celebrates excellence in the diverse manufacturing industries across the region. As one of the winners of this year’s awards Andrew will automatically go through to the grand final Made in the UK Awards where the best of British manufacturing will be celebrated. Blackhill Engineering is part of SC Group, and handles large and complex fabrication and machining projects for customers across multiple sectors including marine, automotive, defence, oil & gas, renewables and nuclear. Its delivery of a 650 tonne steel fabrication contract for the jetty at Hinkley Point C (HPC), which Andrew also worked on, earned Blackhill Engineering two EDF Energy Hinkley Point C Excellence Awards for the Supply Chain – Best Local/Regional Business and Best Manufacturing Equipment Supplier. Lizzie Jones, Director of SC Group, who attended the Awards, said: “We are thrilled for Andrew, it’s a fantastic achievement. The company recognises that the future of the business depends on the next generation progressing so we invest in apprenticeships. We look forward to supporting Andrew throughout his development to achieve his goal of qualifying as an engineer”.